A rather confrontational question was recently posed to me by a guest at a dinner party. The exchange itself was relatively brief so I didn’t get the chance to learn much about the inquisitor. But I suspect that he had at least some training in the conventional medical field. He wondered how in the world I could be supportive of unconventional practices such as acupuncture and guided imagery when there are countless medications that can produce similar effects in a more predictable manner. This “gentleman” went on to list a few of his favorite examples. My response was that many holistic practices tend to encourage the body to augment its own production of biochemicals rather than introducing foreign chemicals to accomplish a comparable end. Several studies of late provide compelling evidence that acupuncture can be a primary therapy or valuable adjunct for a number of health conditions. I’ve specifically selected controlled trials involving human participants to include in today’s column. This variety of research can play a major role in easing the concerns of many earnest skeptics. I think I’m going to play the contrarian here, JP. Just to touch on the skeptic part of the issue. I think the skeptical position regarding acupuncture is two-fold: (1)The things called meridians (which are the points on a body where needles are targeting) have never been proven, nor do they relate to what we know about human physiology; and (2)There is a great deal of disparity amongst acupuncture philosophy and practices (such as disagreement on locations of meridian points, techniques, etc.). As far as my understanding on the topic has shown, when acupuncture is used in a double-blinded, controlled study with a significant sample size – it’s treatment fares no better than placebo. Let’s look at the acne study. 36 people is hardly a good sample size. However, according to the abstract, can you really call this a “controlled study?” There were two groups (standard acupuncture and “ah shi”/standard acupuncture). As far as I can tell, this was testing the difference between the efficacy of two types of acupuncture – not in acupuncture itself. A better study would have had one group receiving the standard acupuncture treatment, another group receiving ah-shi acupuncture, a third group receiving sham acupuncture (placebo), and a fourth receiving no treatment. I just don’t think this study holds up very well because there was no control that accounted for placebo and treatment efficacy itself. The second study, hypertension, has only 15 people. Again, not a good sample size at all. This appears to be a simple pilot study. And even the conclusion of the study suggests as much. I’d like to point out that the majority of acupuncture studies are typically done in Asian countries. While this does not mean anything by itself, I mention it because it’s possible that cultural biases do play a minor role here. When studies are replicated in Western cultures, the results are not. It’s not to say that fraud is being perpetuated, but rather it could be that cultural influences could create a somewhat stronger placebo effect in subjects. On to the third study, this is interesting because they were testing acupuncture and electro-acupuncture (surely the traditions of acupuncture did not incorporate electricity). Again, small sample size of 40. The last two studies both are treating more subjective ailments. Both were lacking sufficient controls. And in the last study, even its own conclusion admitted that the sample size was small. Also it was studying its treatment on depression, but still allowed anti-depressant drugs. So it’s really hard to gauge anything, in my opinion. To sum up, at best, it seems to me that acupuncture possibly has some efficacy on subjective ailments (back pain, depression, etc.) which could be partially placebo, and also because there is a physiological process working during the treatment. When you puncture the skin, its natural healing processes go to work and the pain receptors are inhibited. It’s very plausible that a patient would feel better under those circumstances. But does it help in the long term? I think acupuncture has yet to have any sustained efficacy. And in the short-term, it seems to be lacking any significant evidence that it works. Thank you, Chris! I really appreciate your detailed comments! I agree with the first points you make re: the meridians and the disparity of techniques. I think the argument about sample size is more problematic. I’d bet dollars to donuts that most of the researchers involved would prefer to have 500 or more test subjects but lack the funding. By employing randomized, blinded and crossover designs they’re doing the best they can with what they’ve got. Agreed. The study format could have been better. I wish they would have consulted with us first. I don’t disagree. Nonetheless, the results of pilot studies have merit. I’d love to see a larger study using a similar format – which was quite solid,IMO. Let’s hope someone funds it. As I stated in the piece, I’m all for the scientific evaluation of how and why acupuncture works (in some cases). If it turns out to be something as simple as the physiological consequences of puncturing the skin … so be it. However, this doesn’t appear to the case. My first set of footnotes attest to this fact and I could have included many more. As a side note, if a placebo can be consistently and successfully applied, I’m all for it. Especially if it has a better safety record than conventional treatments with questionable success rates. Antidepressant medications come to mind. I would much rather that the brain heal the body then to introduce a newly manufactured chemical substance into the body with unknown long-term effects. I hope the tone of my reply comes across as being constructive. That’s certainly how I intended it. I sincerely value your thoughtful comments. Thank you. I don’t think your tone was hostile in anyway, I hope mine wasn’t either. While it is true that many scientists would like to have the funding to administrate studies with large sample sizes, it is still important to point out why low sample sizes is problematic. The smaller the study sample size, the more noise in the data. And proponents of pseudoscience have made many claims based on noise. This is particularly true in parapsychology studies. Depending on the size and scope of study, the placebo effect can range from 10% to 35%. Typically, the more subjective the symptoms being treated, the higher the placebo effect. This is particularly true in studies on mood/behavior. I understand your hesitancy towards antidepressant medication. I share some of those concerns. I believe that mood-modifying drugs is over-prescribed. However, I am reluctant to agree with you regarding endorsing placebo as a viable treatment option. While it’s true that placebo is a safe alternative to more invasive treatments, I would not want to endorse placebo as a treatment itself because sometimes subjective symptoms do have an underlying physiological cause. Symptoms for subjective ailments (like depression) can be similar to symptoms for a disease (such as Encephalitis), and no rational person would ever suggest that acupuncture or placebo can cure a disease. And while it’s possible that a patient may have a non-life threatening condition, where placebo or acupuncture, could be used harmlessly – I would argue that it’s never 100% certain that a non-life threatening diagnosis can be determined. Your tone most certainly is not hostile. A patient walks into an allopathic doctor’s office. (S)He has fibromyalgia. (S)He presents a print out of several studies showing that alternative therapies may be helpful in controlling said symptoms. What does the doctor have to offer? Medications? Sure. But like most medications, they primarily manage symptoms. They’re not curative. Then there’s the very real possibility of adverse reactions, drug interactions and the like. Now let’s assume this physician is skeptical of holistic practices. (S)He looks over the print out and thinks many of the same thoughts you’ve mentioned – imperfect study designs, potential of cultural bias, small studies, etc. What should (s)he do? In my opinion (s)he should work with the patient to establish *if* the alternative therapy works for them in a safe manner. Rather than discourage them and pressure them to take a non-curative drug with the potential for harm … (s)he should help them to objectively and subjectively determine if the alternative is safe and viable. Call it a test case. To me, that’s a good middle-ground. To be clear, I always think it’s a wise decision to seek out a diagnosis from a medical professional. However, I don’t see how using a drug or surgery to treat a mistakenly diagnosed condition yields any additional benefits over an alternative remedy. This is especially true if allopathic physicians would be more willing to work with patients who wish to utilize alternatives while under the supervision of an allopath. Again, a good middle-ground, IMO. I was a skeptic and acupuncture cured my severe asthma. It also cured shingles for my mother and 2 sisters. Fibromyalgia is a good example, and I would agree. It’s a relatively new ailment – and has yet to be completely figured out. I think looking at alternative treatments would be an option worth considering, especially since a common symptom correlated with it is lack of sleep – and there are many lifestyle and/or natural ways of handling poor sleep. Thank you, Sue. I’ll check it out. Evid Based Complement Alternat Med. 2015;2015:143858. Acupuncture therapy is more effective than artificial tears for dry eye syndrome: evidence based on a meta-analysis. Background. The efficacy of acupuncture in dry eye syndrome patients remains controversial. Methods. Pubmed, Ovid, Cochrane libraries, CNKI, Wanfang, and CQVIP databases were electronically searched until October 1, 2014. Outcomes including tear break-up time (BUT), Schirmer I test (SIT), and cornea fluorescein staining (CFS) were analyzed. A meta-analysis was performed using both fixed- and random-effects models based on heterogeneity across studies. Results. Seven studies were included in this study; 198 and 185 patients were randomly treated with acupuncture and artificial tears, respectively. The overall BUT of patients in acupuncture group was significantly longer than that of the artificial tears group after treatment (P < 0.00001). The SIT was significantly higher in the acupuncture group than that in the artificial tears group after treatment (P = 0.001). The CFS of patients in acupuncture group was significantly improved compared to that in artificial group (P < 0.0001). Conclusions. Acupuncture therapy is effective for the dry eye patients, partly better than artificial tear treatment. Complement Ther Clin Pract. 2015 Aug;21(3):193-200. To study the biological effects of acupuncture on depression, we hypothesized that acupuncture will exert its antidepressant effect through a bottom-up neuromodulation of the autonomic dysfunction in depression. The participants received press needle (PN) acupuncture for 72 h continuously in a sham-controlled design. Psychological assessments and Holter electrocardiography were performed before and after PN acupuncture. We evaluated their autonomic functions through the heart rate variability (HRV). As a result, following PN acupuncture participants showed significant improvement in the Beck’s Depression Inventory scores (P = 0.031), systolic/diastolic blood pressures (P = 0.002/P = 0.011), and coefficient of variation of the R-R interval (P < 0.0001), compared to sham PN. The present findings showed PN acupuncture induced alterations in vagal function, blood pressure, and Beck’s Depression Inventory scores. It was suggested that vagal stabilization effect by acupuncture may be associated with the therapeutic mechanism in depression. Evid Based Complement Alternat Med. 2015;2015:860463. Brain-Gut Axis Modulation of Acupuncture in Functional Dyspepsia: A Preliminary Resting-State fcMRI Study. Objective. To explore acupuncture effects on brain functional connectivity in patients with functional dyspepsia (FD). Methods. Eight patients in an acupuncture treatment group and ten healthy adults in the control group participated in the study. Acupuncture effectiveness was evaluated based on changes of the gastrointestinal symptoms, gastric motility measurements, and gastrin levels and comparisons with the control group when appropriate. To investigate functional connectivity changes related to FD and potential modulation after acupuncture, a set of regions of interest (ROIs) were selected according to previous fMRI reports of acupuncture. Results. 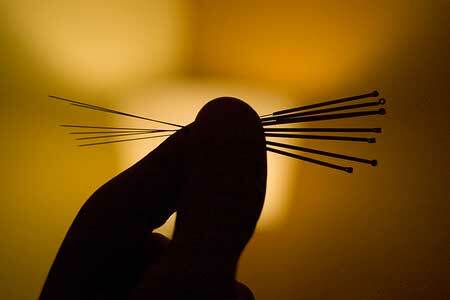 Patients showed significant improvements of FD signs and symptoms after acupuncture treatments. For all of the ROIs, we identified subportions of the networks showing reduced connectivity in patients with FD. Connectivity between the ROIs and corresponding disease targets showed significant improvement after acupuncture treatment (P < 0.05) in all ROIs except for right medial temporal lobe-hippocampus and right inferior parietal lobule. Conclusion. Functional connectivity of the brain is changed in patients with FD but approximates that in healthy control after acupuncture treatment. The relief of gastrointestinal signs and symptoms by acupuncture is likely due to the normalization of brain-gut axis associated with FD. OBJECTIVE: The aim of the study was to evaluate the short and long-term effects of acupuncture on vasomotor symptoms (VMS) and quality of life-related measures. METHODS: A total of 209 perimenopausal and postmenopausal women aged 45 to 60 years, experiencing four or more VMS per day, were recruited from the community and randomized to receive up to 20 acupuncture treatments within the first 6 months (acupuncture group) or the second 6 months (waitlist control group) of the 12-month study period. The primary outcome was mean daily frequency of VMS. Secondary outcomes were VMS interference with daily life, sleep quality, depressive symptoms, somatic and other symptoms, anxiety, and quality of life. RESULTS: The VMS frequency declined by 36.7% at 6 months in the acupuncture group and increased by 6.0% in the control group (P < 0.001 for between-group comparison). At 12 months, the reduction from baseline in the acupuncture group was 29.4% (P < 0.001 for within-group comparison from baseline to 12 months), suggesting that the reduction was largely maintained after treatment. Statistically significant clinical improvement was observed after three acupuncture treatments, and maximal clinical effects occurred after a median of eight treatments. Persistent improvements were seen in many quality of life-related outcomes in the acupuncture group relative to the control group. CONCLUSIONS: We found that a course of acupuncture treatments was associated with significant reduction in VMS, and several quality-of-life measures, compared with no acupuncture, and that clinical benefit persisted for at least 6 months beyond the end of treatment. Ann Allergy Asthma Immunol. 2016 May 3. Effect of acupuncture on house dust mite specific IgE, substance P, and symptoms in persistent allergic rhinitis. BACKGROUND: Clinical evidence suggests that acupuncture improves symptoms in persistent allergic rhinitis, but the physiologic basis of these improvements is not well understood. OBJECTIVE: A randomized, sham-controlled trial of acupuncture for persistent allergic rhinitis in adults investigated possible modulation of mucosal immune responses. METHODS: A total of 151 individuals were randomized into real and sham acupuncture groups (who received twice-weekly treatments for 8 weeks) and a no acupuncture group. Various cytokines, neurotrophins, proinflammatory neuropeptides, and immunoglobulins were measured in saliva or plasma from baseline to 4-week follow-up. RESULTS: Statistically significant reduction in allergen specific IgE for house dust mite was seen only in the real acupuncture group, from 18.87 kU/L (95% CI, 10.16-27.58 kU/L) to 17.82 kU/L (95% CI, 9.81-25.83 kU/L) (P = .04). A mean (SE) statistically significant down-regulation was also seen in proinflammatory neuropeptide substance P (SP) 18 to 24 hours after the first treatment from 408.74 (299.12) pg/mL to 90.77 (22.54) pg/mL (P = .04). No significant changes were seen in the other neuropeptides, neurotrophins, or cytokines tested. Nasal obstruction, nasal itch, sneezing, runny nose, eye itch, and unrefreshed sleep improved significantly in the real acupuncture group (postnasal drip and sinus pain did not) and continued to improve up to 4-week follow-up. CONCLUSION: Acupuncture modulated mucosal immune response in the upper airway in adults with persistent allergic rhinitis. This modulation appears to be associated with down-regulation of allergen specific IgE for house dust mite, which this study is the first to report. Improvements in nasal itch, eye itch, and sneezing after acupuncture are suggestive of down-regulation of transient receptor potential vanilloid 1. J Tradit Chin Med. 2016 Apr;36(2):151-9. Curative effect of acupuncture on quality of life in patient with depression: a clinical randomized single-blind placebo-controlled study. OBJECTIVE: To evaluate the effect of acupuncture on the quality of life in patients with depression by clinical randomized single-blind placebo-controlled study. METHODS: One hundred and sixty-three cases of depression according with the inclusion criteria were randomly divided into a group of acupuncture dredging liver and regulating flow of theosophy (group 1), a group of acupoint shallow stab (group 2) and a group of non-acupoint shallow stab (group 3) at 1 : 1 : 1 ratio, and treated with acupuncture, moxibustion, and intradermal embedding of needle, twice a week, for a total of 12 weeks. Scale of Quality of Life (SF-36) was used to measure the scores at four different time points and evaluate the effect of acupuncture on the quality of life of the patients with depression. RESULTS: At each time point after treatment, in scores of the 8 items, physical function, physical role, bodily pain, general physical condition, energy, social function, emotional function and mental health there were statistically significant differences among the 3 groups (P < 0.0125). CONCLUSION: Acupuncture can effectively improve the quality of life of patients with depression. Acta Reumatol Port. 2017 Jan-Mar;42(1):32-37. The effects of acupuncture versus sham acupuncture in the treatment of fibromyalgia: a randomized controlled clinical trial. OBJECTIVE: The aim of this manuscript is to determine and to compare the efficacy of real acupuncture with sham acupuncture on fibromyalgia (FM) treatment. METHODS: 50 women with FM were randomized into 2 groups to receive either true acupuncture or sham acupuncture. Subjects were evaluated with VAS (at night, at rest, during activity), SF-36, Fibromyalgia Impact Questionnaire (FIQ), Beck Depression scale (BDI), Fatigue Severity Scale (FSS) at baseline, 1 month and 2 months after the 1st session. Patients in both groups received 3 sessions in the 1st week, 2 sessions/week during 2 weeks and 1 session/week in the following 5 weeks (totally 12 sessions). RESULTS: 25 subjects with a mean age of 47,28±7,86 years were enrolled in true acupuncture group and 25 subjects with a mean age of 43,60±8,18 years were enrolled in sham acupuncture group. Both groups improved significantly in all parameters 1 month after the 1st session and this improvement persisted 2 months after the 1st session (p<0,05). However, real acupuncture group had better scores than sham acupuncture score in terms of all VAS scores, BDI and FIQ scores either 1 or 2 months after the 1st session (all p<0,05). CONCLUSION: Acupuncture significantly improved pain and symptoms of FM. Although sham effect was important, real acupuncture treatment seems to be effective in treatment of FM. J Altern Complement Med. 2017 Apr 14. Effects of Acupuncture on Gait of Patients with Multiple Sclerosis. Multiple sclerosis is considered a complex and heterogeneous disease. Approximately 85% of patients with multiple sclerosis indicate impaired gait as one of the major limitations in their daily life. Acupuncture studies found a reduction of spasticity and improvement of fatigue and imbalance in patients with multiple sclerosis, but there is a lack of studies regarding gait. We designed a study of acupuncture treatment, according to the Heidelberg model of Traditional Chinese Medicine (TCM), to investigate if acupuncture can be a useful therapeutic strategy in patients with gait impairment in multiple sclerosis of relapsing-remitting type. The sample consisted of 20 individuals with diagnosis of multiple sclerosis of relapsing-remitting type. Gait impairment was evaluated by the 25-foot walk test. The results showed differences in time to walk 25 feet following true acupuncture. In contrast, there was no difference in time to walk 25 feet following sham acupuncture. When using true acupuncture, 95% of cases showed an improvement in 25-foot walk test, compared with 45% when sham acupuncture was done. Our study protocol provides evidence that acupuncture treatment can be an attractive option for patients with multiple sclerosis, with gait impairment. J Acupunct Meridian Stud. 2017 Aug;10(4):240-244. Immediate Effect of Needling at CV-12 (Zhongwan) Acupuncture Point on Blood Glucose Level in Patients with Type 2 Diabetes Mellitus: A Pilot Randomized Placebo-Controlled Trial. INTRODUCTION: Diabetes mellitus is a major global health problem. Needling at CV-12 has reduced blood glucose level in diabetic rats. The aim of this study was to evaluate the effect of needling at CV-12 (Zhongwan) on blood glucose level in patients with type 2 diabetes mellitus (T2DM). MATERIALS AND METHODS: Forty T2DM patients were recruited and randomized into either the acupuncture group or placebo control group. The participants in the acupuncture group were needled at CV-12 (4 cun above the center of the umbilicus), and those in the placebo control group were needled at a placebo point on the right side of the abdomen (1 cun beside the CV-12). For both groups, the needle was retained for 30 minutes. Assessments were performed prior to and after the intervention. Statistical analysis was performed using SPSS version 16. RESULTS: There was a significant reduction in random blood glucose level in the acupuncture group compared to baseline. No such significant change was observed in the placebo control group. CONCLUSION: The result of this study suggests that 30 minutes of needling at CV-12 might be useful in reducing blood glucose level in patients with T2DM. Efficacy and safety of acupuncture treatment on primary insomnia: a randomized controlled trial. OBJECTIVE: The objective of this study was to evaluate the efficacy and safety of acupuncture treatment for primary insomnia. METHODS: We conducted a single-center, single-blinded, and randomized controlled clinical trial. Seventy-two patients with primary insomnia were randomly assigned into two groups – the acupuncture group, who received acupuncture treatment, and the control group, who received sham acupuncture treatment. The treatment was given three times a week for four weeks. Patients were asked to wear sleep monitors and complete questionnaires every two weeks for a total of eight weeks. The primary outcome was the Insomnia Severity Index (ISI). The secondary outcomes were sleep parameters including sleep efficiency (SE), sleep awakenings (SA) and total sleep time (TST) recorded by the Actigraphy, as well as scores of the Self-Rating Anxiety Scale (SAS) and the Self-Rating Depression Scale (SDS). RESULTS: Compared with pretreatment baseline, patients in both groups had varying degrees of improvements in their sleep conditions. Paired t-test showed that there was a significant difference in all indicators in the acupuncture group before and after acupuncture treatment. One-way analysis of covariance adjusted for baseline scores indicated that the ISI improved dramatically in the acupuncture group at two weeks post-treatment (F = 11.3, p = 0.001), four weeks post-treatment (F = 33.6, p < 0.001), 2 weeks follow-up (F = 39.4, p < 0.001) and four weeks follow-up (F = 34.1, p < 0.001). Similar significant improvements can also be observed in the SE, TST and SDS scores. Although no differences in SA and SAS were shown between the two groups until the end of the treatment, remarkable decrements in SA and SAS were found in the acupuncture treatment group after the two-week and four-week follow-ups. CONCLUSION: Acupuncture treatment is more effective than sham acupuncture treatment in increasing insomnia patients’ sleep quality and improving their psychological health. Pain Med. 2017 Dec 6. Effects of Acupuncture Treatment on Fibromyalgia Symptoms, Serotonin, and Substance P Levels: A Randomized Sham and Placebo-Controlled Clinical Trial. Objective: The aim of this study was to evaluate the effects of acupuncture treatment on serum levels of serotonin and substance P (SP) as well as on clinical parameters in patients with fibromyalgia (FM). Methods: This is a randomized controlled clinical trial. Seventy-five women with FM were randomized into one of three kinds of acupuncture treatment: real acupuncture group (AcG), sham acupuncture group (ShG), and simulated acupuncture group (SiG). Treatments were applied semiweekly for four weeks. The serum levels of serotonin and SP were evaluated before and after the eight sessions. Patients were clinically assessed by visual analog scale (VAS), the number of tender points (NTP), Fibromyalgia Impact Questionnaire (FIQ), Beck Depression Inventory (BDI), and Nottingham Health Profile (NHP) at baseline, after the last treatment, and one and three months after completion of all treatments. Results: Serum serotonin values increased significantly after treatment in AcG and ShG (P < 0.001 and P < 0.01, respectively). The increase in the AcG was also different from both of the other groups (P < 0.01). While SP levels decreased in the AcG, they increased in the SiG (P = 0.001). In the AcG, significant improvements were found in almost all clinical outcomes after treatment. These usually continued for three months. In the ShG, there were also significant changes on the NTP, VAS, FIQ, and BDI scores after treatment. Improvements on the NTP and FIQ scores lasted for three months. In the SiG, significant improvements were found only in the NTP, VAS, and BDI scores after treatment. J Paediatr Child Health. 2018 Apr 6. Pilot study of acupuncture to treat anxiety in children and adolescents. AIM: This pilot study investigated the use of acupuncture in the treatment of paediatric anxiety. METHODS: Children with anxiety, aged 8-16, were randomised to either the acupuncture or waitlist control groups. Anxiety was measured using the Hamilton Anxiety Rating Scale (HAM-A) for children and adolescents with generalised anxiety disorder and Multidimensional Anxiety Scale for Children 2nd Edition (MASC-2) self-rated and parent-rated forms. RESULTS: Twenty participants were enrolled in the study and 19 completed all the questionnaires to be included in the analysis. There were no differences in socio-demographic characteristics at baseline between the two groups. At the second assessment, the mean MASC-parent score for the acupuncture group was significantly lower than the waitlist group (65.6 (SD 15.0) compared to 81.0 (SD 11.9), P = 0.025) with an effect size = 1.13. The pre- and post-treatment comparisons were also significantly lower for both groups in the anxiety measures. In the acupuncture group, MASC-parent (P = 0.008, effect size 0.75) and the HAM-A (P < 0.001, effect size 1.4). In the waitlist group, MASC-self (P = 0.022; effect size 0.4), MASC-parent (P = 0.048; effect size 0.75) and HAM-A (P = 0.007; effect size 1.21). CONCLUSIONS: This study provided promising results on the potential use of acupuncture to treat children and adolescents with general anxiety. Future research using an randomised control trial with a sufficient sample size to control for confounds and sham (placebo) comparators is warranted.